Wind energy suffers from an image problem: because it’s intermittent, wind complicates the grid’s operation and requires fossil fuel power plants for backup. But wind farms could actually improve power reliability in an economic way, according to a recent study. In an analysis, the National Renewable Energy Laboratory (NREL) showed that wind farms can quickly change their output to provide frequency regulation, a service grid operators rely on to ensure reliable power delivery. 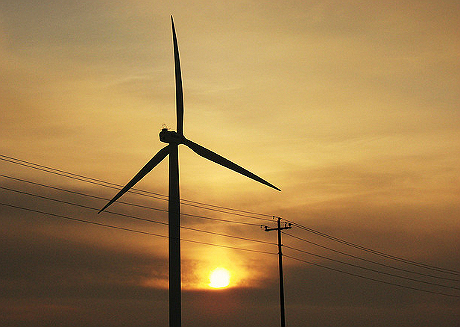 The finding could change how regulators, grid operators and wind-farm owners view wind energy. Today, natural gas power plants are often used for frequency regulation. They ramp up output to maintain a balance between power supply and demand, which keeps the grid’s frequency signal stable. Wind turbines can perform the same function by lowering their output, according to NREL wind analyst and study co-author Erik Ela. By changing the pitch of their blades slightly, wind turbines can make second-by-second curtailments that allow grid operators to keep the power supply and demand in balance, he said. Normally, a wind farm operator would not want to curtail a wind farm, since they earn money based on how many megawatts-hours are sold. And because the fuel is free, wind power is typically tapped before other forms of power generation in wholesale energy markets. But in certain situations, a wind farm can earn more money by providing frequency regulation services, said Ela. “Because the grid values these services so much, [wind farms] can actually earn more money by curtailing and providing services than if they’re providing energy,” he said. For example, there are times in the middle of the night when wholesale energy prices are negative because there is excess wind power. At those times, frequency regulation services would be more valuable than providing energy. Wind turbine manufacturers have already developed the power electronics that could allow the turbine to adjust its power output, and most turbines installed in the last five years already have the necessary sensors. But wind farm operators haven’t asked for these additional features because there isn’t a great deal of awareness about the potential for active power management, said Ela. Since power electronics can act very quickly, wind turbines could act faster than fossil fuel plants in providing frequency regulation. NREL conducted simulations at its National Wind Technology Center in Boulder, Colorado and found that these adjustments don’t cause any significant mechanical problems. However, regulations would have to change to allow wind power to provide frequency regulation. Texas is the only state where that’s currently possible. It’s also done in Denmark and Spain. As more renewable energy sources get hooked up to the grid, wind turbine operators will likely pay more attention to grid stabilization services, Ela predicts. The study echoes some other findings that create a slightly different picture of wind, which currently requires having natural gas power plants on standby to compensate for wind energy’s frequent dips and bursts in production. IBM last year developed a system to gather data from wind turbine sensors to predict the output of wind and solar with a high degree of accuracy, making it easier for grid operators to integrate wind. General Electric, meanwhile, has complemented its wind turbines with analytics and relatively small energy-storage devices in order to create a more consistent power output onto the grid.